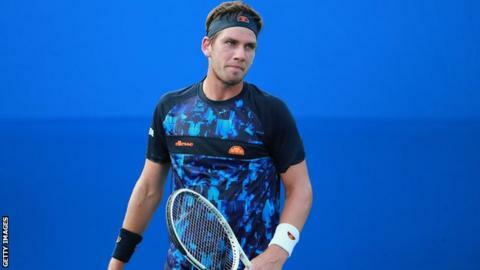 Britain's Cameron Norrie and Johanna Konta both won to reach the second round of the Mexican Open. Norrie, 23, beat Japan's Yoshihito Nishioka 6-2 2-6 6-2, while Konta, 27, overcame Germany's Laura Siegemund 6-3 6-2 in Acapulco. Spain's Rafael Nadal beat Germany's Mischa Zverev 6-3 6-2 in his first match since losing the Australian Open final in January. Nadal has reached the Mexico Open final in his three previous appearances. "I'm happy for the victory. It's never easy against Mischa, especially without competing for a while," said 32-year-old Nadal, who will next face Australian Nick Kyrgios. "This tournament is hard and there's a lot of great players, so these kinds of matches can happen in the early stages. "Nick is one of the most talented players on tour. It's a big challenge for me and I hope to be ready for it." Zverev's brother Alexander, the second seed, lost only one point on serve in a dominant 6-3 6-3 win against Alexei Popyrin. Third seed John Isner served 18 aces in a 6-3 4-6 6-3 victory over France's Adrian Mannarino. Norrie, the British number two and world number 64, beat Nishioka in two hours and 18 minutes to set up a meeting with fourth seed Diego Schwartzman of Argentina. Eighth seed Konta, ranked 45 in the world, needed an hour and 11 minutes to see off Siegemund, her doubles partner, who is ranked 60 places below her. Konta, who did not face a single break point, broke early in the opening set and twice in the second before sealing the win on her first match point. In the third round, she will face Russian world number 167 Varvara Flink, who went through after Amanda Anisimova retired. Australian Open semi-finalist and second seed Danielle Collins was beaten 6-1 6-2 by former world number one Victoria Azarenka of Belarus. In the opening round of the men's doubles, top seeds Jamie Murray of Britain and Brazilian Bruno Soares suffered a 6-2 7-6 (7-4) defeat by Sweden's Robert Lindstedt and American Frances Tiafoe. Meanwhile, at the Dubai Duty Free, Britain's Dom Inglot and Croatia's Franko Skugor lost 6-2 6-2 to Japan's Ben McLachlan and Jan-Lennard Struff of Germany in the men's doubles. But Briton Joe Salisbury and American Rajeev Ram, the fourth seeds, reached the quarter-finals with a 6-2 6-1 success over Russians Karen Khachanov and Daniil Medvedev.